Recently, I decided to have a look at all the business software we are currently using and to re-evaluate to see if perhaps it was time to consider some new software. The reason for this decision, was two-fold, with the primary reason being cost. When my company merged with another in 2007, we were merging PC and Mac users. I was tasked with finding software for accounting and CRM that could be accessble to both users. After researching the very few solutions at the time, I settled on Netsuite. It gave us the ability to share all of our accounting and CRM info in the cloud, as well as some other tools for project management, etc. It was definately overkill for our small business, but there weren't a lot of options at the time and having a cloud solution meant we could all access the data from wherever we were and from whatever computer we were sitting at. Fast forward to 2013 and we're still using Netsuite. As our company has grown, we have needed to add additional licenses. The expense is one of the largest we incur outside of payroll and our rent. Netsuite is a fantastic tool, but we were only using a fraction of it's capabilities for our small business. So, I began researching what tools we'd need if we were to replace Netsuite. In this blog post, I'll share with you some of the tools I looked at and what I've found. Storing sensitive client info, like passwords, etc. Here’s some solutions that I’ve found that are either low or no cost that you might want to check out. Most are cloud applications so PC/Mac doesn’t matter. I quickly ruled out Quickbooks Online as it didn't allow for all the functions I needed for the way we bill jobs. I needed the Quickbooks Premier edition but wanted something that was accessible to my Administrative Assistant, Bookkeeper and Accountant without having to go through all the networking headaches for desktop installation and sharing. A colleague of mine mentioned Swizznet. They host Quickbooks for you online. And I could lease instead of purchasing the license, which means no more worries about upgrading. And they offer support, which is something you have to pay Intuit for. Netsuite was a challenge for any accountants or bookkeepers I've used over the years. It seems that they all are familiar with Quickbooks and I thought using Quickbooks would make life easier. Freshbooks looked really good, but I couldn’t use for the number of employees I have and for time tracking. I really like the way it automatically sends clients with outstanding invoices reminders to pay. It allows them to easily pay online. I tried the free 30 day trial. If I were a smaller company, I probably would have chosen Freshbooks. I've heard quite a few good things about Xero. It seems to be a step up from Freshbooks. The monthly fees were a bit higher than what I would pay for QUickbooks/Swizznet though. There's a bunch of add ons you can use to extend functionality. It's probably a good solution for a smaller business, but I wasn't comfortable with the number of add ons I'd need, all from different vendors. I was worried about support. Speaking of Add Ons, I did have to use one Add On for Quickbooks for Time Tracking. All of our employees track the time we spend on jobs. Even if we don't bill for time, it's how I can gauge profitability on individual jobs. There are several add ons for Quickbooks, but I settled on Minute7.com because of the price and ease of use. It was the simplest to install and I can control how it synchs with Quickbooks to keep all of the data updated on both applications. It's nice that my employees don't need access to Quickbooks to use, just a login for Minute7.com. This is $10/mo for one user. I liked it a lot, but I’d need 5 users, so at $50/mo. it was too pricey for just a contact manager. It would be a good alternative to something like Salesforce though as in addition to CRM, you can track leads, opportunities, etc. Our email is hosted with Appriver and that means we can share our address books. I decided this would suffice, but it's not nearly as convenient as Netsuite. In Netsuite, we had all contact for a company in one place. In Outlook, each contact is its own record, but you can always do a search by company name. The truth is, that while the consolidated customer records were nice to have, it really wasn't something we really needed. I don't want to ignore Google Apps here. Google Mail is becoming more and more widely used. It's probably worth looking at, although I believe you need one of the premier editions to share your contact database...I could be wrong though. You're probably familiar with Salesforce and how it's used for opportunities, leads, contacts, etc. They have a contact manager only solution for $5/month. Also include tasks and event tracking. I was looking for other functionality so, if I were to go with Salesforce, I'd have to go with one of the higher priced plans. We're already paying for Appriver, so I decided against Salesforce. I chose Asana for task managment. It’s free and simple and you can access on your desktop and mobile devices as it synchs automatically. You can assign tasks to people who are not in your organization too, like clients and vendors. It will email you reminders of all open tasks. Tasks can be assigned to “projects”. I like that it's just so easy to use. Create projects for each client, assign team members, add tasks with due dates and keep a running comment stream. You can attach files too, but we keep our files in a system on our server. I like this a lot too and it's free. I use it for personal stuff, but you can share with others like in Asana. It synchs automatically with phone and mobile devices and you can save all kinds of things associated with your notes. The free version is really robust, although they do offer a paid version with more bells and whistles. Widely used in our industry, but really overkill for what I was looking for. It's better suited for managing large projects with multiple team members as you can keep track of every task, conversation and asset associated with a particular project. Storing sensitive client data for us to share has been the toughest to find a free solution for. Since Netsuite access is password protected, we used to keep this info in the notes associated with client jobs. So, for now, we’re just using a password protected spreadsheet that we keep in a secure area of our server. I’m not referring to files, etc. though. That we just have organized on the server which is not publicly accessible anyway. I came across a really nice solution for file sharing at Sharefile.com which is a Citrix product. We currently use Dropbox for sharing large files with users outside of our office and it's a great tool. I never have to explain to clients how to get or send files. We used to use YouSendIt, but Dropbox is way more user friendly. We got by with the free version for quite some time as you can get additional storage by inviting others to sign up. But, even the paid versions are reasonable if you need more space. This got me thinking about what to do when our "server" needs replacing. It's not really a server anyway. It's a computer that we use for file sharing with permissions set up so particular users have access to the areas we want them to have access to. We don't share applications. As a matter of fact, we're slowly moving our applications to the cloud as well. Most recently, we switched to Adobe Creative Suite in the cloud. I'm thinking we can replace that machine with a service like Sharefile and do away with our backup system. We currently backup our files offsite at iBackup and again onsite using a separate backup drive. My IT partner recommended iBackup to me when I struggling with finding a solution for backing up our server files offsite. So far, so good. It backs up everything and I can restore anything I need. I tried several solutions prior, but all of them were "buggy". It's less expensive than some I've looked at. We have lots of large files, and a lot of data to back up. If for any reason, there's an issue with backing up, iBackup sends me an email to alert me. We still have onsite backup as well, but it's good to know that all of our data is safe in the cloud. One of the features of Netsuite that I used all the time was tracking opportunities and forecasting. It's really important to be able to see what you have in your pipeline and Quickbooks doesn't have anything like this. The 2013 version of Quickbooks has what they call a Lead Center, but it doesn't do any forecasting at all. One of my clients recommended this to me and I love it. It's free and gives me all of the features I used in Netsuite for forecasting. I use it to keep track of prospects and open proposals. It gives me reports about what is in my pipeline and helps with forecasting. If you decide to use Salesforce, look at that first though as different versions give you the same features. Insightly also has some project management tools, but I haven't really looked at those since I'm happy with Asana and I didn't want to have employees logging into different tools for different things. Here are a couple of other tools I use that I use almost every day find invaluable. This is a password keeper tool. Works on both PC and Mac. Keeps all your passwords and you only have to remember the one master password. There are different versions, both free and paid. I love the Roboform Everywhere version that synchs up with my devices, including my iphone. Snagit is a screen capture tool that makes it super simple to grab screen images, web pages and video screen captures. The Snagit Editor allows you to edit your images and add notes. With a press of a button, I can grab a screen, make my notes, click to copy and then paste it into an email or document. Really easy to use and a real time saver. I hope you find this list useful. It took me several weeks to research and finally settle on a suite of tools that works for us. Truthfully, I'm still getting used to them and logging in and out of different tools, and accessing information in different places when it used to be all in one spot is a bit of a hassle. But, then I think about the savings and I feel better about my decision. 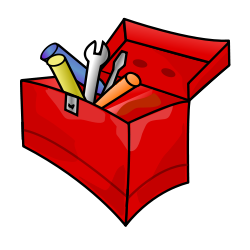 If you have any tools that you love or suggestions for any of the tasks discussed, please share them with us on our facebook or twitter page. I'd love to hear from you!